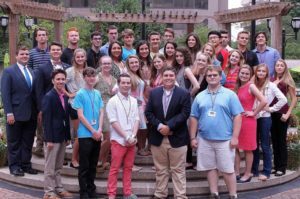 The TAR Leadership Conference is an annual opportunity to meet and network with TARS from across the United States. You’ll spend a week in Washington, D.C. listening to VIP GOP speakers, learning how to enhance the effectiveness of your TAR Club and grow in your leadership skills. Throughout the conference, you will have the chance to tour our Nation’s Capital, meet with senators, congressmen, and national Republican leaders. TARS in 2016 got the chance to tour George Washington’s Mount Vernon estate, while we got to tour the White House in 2017! Our speakers vary each year, but previous speakers have included: Senator Marco Rubio, Senator Mike Lee, Senator Thom Tillis, Speaker Paul Ryan, Congressman Adam Kinzinger, RNC Chairman Reince Priebus, and many more! Tuition for TLC is $998, which includes: your hotel room for 5 nights, meals, metro tickets, tours, event fees, transportation to & from the airport and conference materials. This does not include airfare or other expenses traveling to and from D.C.
Stay tuned for more information about TLC 2018! In the mean time, learn more about the conference from this awesome video by Outstanding TAR Emma Capps!